You Don’t Want to Miss This Year’s Austin Piano Festival! 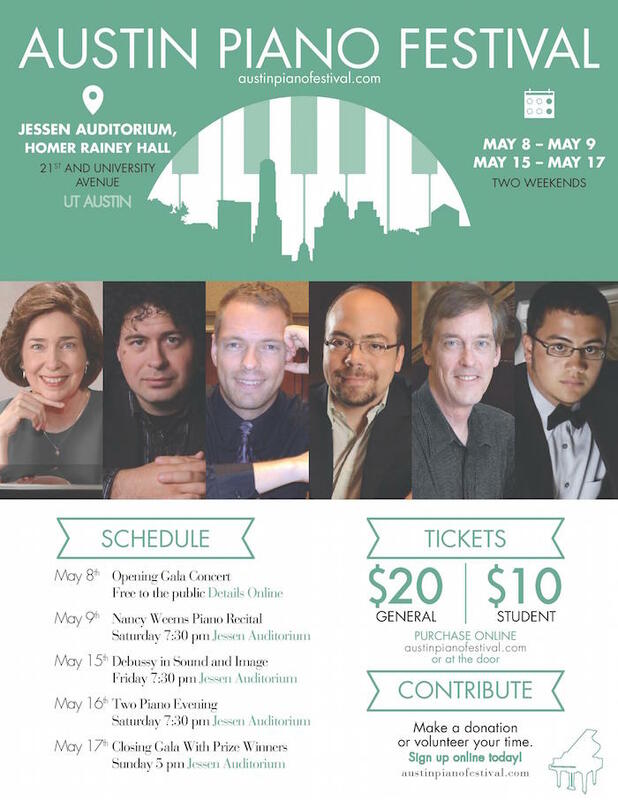 Many of you know about Austin Piano Festival – a great organization I work with here in town. We’re kicking off our two weekend piano celebration in only a couple of weeks. There’s so much great stuff to say about APF that I don’t know where to begin. I can tell you this though: if you’re even remotely close to central Texas, you won’t want to miss these concerts. Here are some highlights of the festival, which runs from May 8th – May 17th. Masterclasses – This year we will feature seven masterclasses with visiting guest artists. And all of them with extremely talented middle school, high school, and college pianists. These are free and open to the public and a rare chance to see the interaction between top-level students and seasoned professionals. You can see the full schedule here. Concerts – I’m often asked what are the best concerts in our series to attend and it’s honestly a question I can’t answer. They will all be phenomenal, and they’re all unique. We kick off with an Opening Gala that’s free to the public (you can reserve seats here), and the following evening have an exciting solo recital featuring the amazing Nancy Weems. On the second weekend APF presents three concerts! “Debussy in Sound and Image” combines the music of Claude Debussy with the visual imagery surrounding it. Our Two Piano Recital features a range of famous and rare music, including some world premiere transcriptions! The Closing Gala Concert concludes the series – featuring a mixture of our festival artists and the treat of hearing performances by our 2015 festival prize winners! And if you want a preview of these amazing young artists (you won’t believe your ears) you can listen to them broadcast live here on Austin’s KMFA.